NorCal Soccer Dad – Perspectives on youth soccer and the NorCal soccer landscape. Lifelong player and student of the beautiful game in Germany, England, and USA. USSF referee and volunteer futsal coach. Perspectives on youth soccer and the NorCal soccer landscape. Lifelong player and student of the beautiful game in Germany, England, and USA. USSF referee and volunteer futsal coach. Enter your email to have new posts sent to you. Just another action shot. Happens to be my daughter...😉. Awesome turf futbol field in my friend's backyard. Including lighting. Now this is love for the game! Kayleen at iD2 camp in Arizona. Great experience! Champions at USYF Regional in Sacramento today. Great job, girls! Are the failures at the U17 and U20 Women’s World Cups a symptom of deeper YNT problems? Pitfalls of affiliation with European pro soccer clubs? read more Are the failures at the U17 and U20 Women’s World Cups a symptom of deeper YNT problems? What makes a country good at soccer? read more What makes a country good at soccer? The first English soccer player dies of CTE. Kevin Moore was in his 40s when he showed signs of brain disease. read more The first English soccer player dies of CTE. Kevin Moore was in his 40s when he showed signs of brain disease. Last Saturday’s Atletico Madrid vs FC Barcelona game was a perfect example of modern top-level soccer. It had everything – skills, technique, creativity, excellent off-the-ball movement, great defending and goalkeeping, playing out from the back, spacing, pressing, shooting, passion, pace, team work….the list goes on. This is how huge the gap is in our country. This is where we need to be if we want to compete internationally. 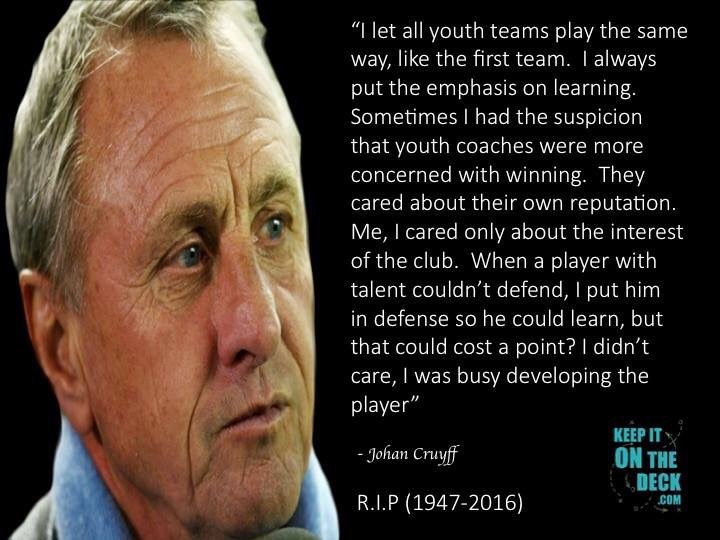 And to reach this level of soccer sophistication requires a fundamental revamp of how we teach, play, and organize soccer. It starts with our coaching quality, and includes finding a way for our best/better players to avoid college soccer. I’m including here a 12-minute highlights clip, but it doesn’t do the game justice. I strongly encourage you to find a recording of the full game and watch it with your soccer-playing kids. It’s very entertaining and a great learning opportunity. U.S. Men’s Soccer: What Happened? read more U.S. Men’s Soccer: What Happened? Disgraceful – time to cut the BS! read more Disgraceful – time to cut the BS! Playing to win felt great! And that’s the problem. read more Playing to win felt great! And that’s the problem. Player development – a legend’s views. Play with happiness. Play free. Be creative. Just play with the ball. read more Play with happiness. Play free. Be creative. Just play with the ball. Probably goal of the season in the EPL – enjoy! We won’t compete internationally until we develop players like Coutinho. Period. read more What’s troubling with this?